Now Twelfth Night has passed, I’m feeling it’s time to Jumpstart January. Whilst these vanilla almond cookies aren’t exactly healthy, they aren’t too bad for you either. They contain freshly ground almonds and wholemeal spelt flour and the sugar content is relatively low. I’m also trying to eat more vegan meals than usual this month to celebrate Veganuary, so I’ve made them vegan. As I mostly cook and bake with whole foods, the majority of the recipes I make are highly nutritious, but expect to see less sweet treats and more vegan meals than usual for the rest of this month. And why limit this to food only? I reckon it’s time to try a dairy-free alternative to milk: cue Rice Dream. As the name suggests, Rice Dream is a dairy-free milk made from rice. It was the first rice milk commercially available in the UK and has been with us for thirty years. It contains no added sugars or sweeteners and the only additions are a tiny percentage of sunflower oil, calcium carbonate, vitamin B12, vitamin D and salt. I was challenged to create a little tea party and try Rice Dream in a cup of tea to see how I found it. I figured a batch of these vanilla almond cookies seemed like the ideal foil for a nice cup of tea and were festive enough for any post Christmas gatherings. They also filled up the biscuit tin in case of any unexpected guests, which is just as well as I had several. I like my tea very weak, so I’m quite sensitive to the taste of any added milk. I tried the rice milk with Earl Grey and a more traditional breakfast tea and can honestly say I liked it and was happy with both cups. The flavour is good, without compromising the tea’s taste and it didn’t split as I’ve noticed some non-dairy milks do. CT, who drinks his tea a little stronger than me, also found it more than acceptable. I’ve been using Rice Dream in a few things over the last week or so. It makes delicious vegan porridge for breakfast and I can report it produces an excellent vegan golden latté using maple syrup rather than honey. I used the Rice Dream to bind my vanilla almond cookies together too. You can try Rice Dream for yourself and see what you think. If you buy one of the “try me for free” 1 litre promotional packs, you can get your money back if you don’t like it. Do hurry though as this is only available on 120,000 via Tesco and Asda. They have an RRP of £1.50. These vanilla almond cookies are easy to make and quite delicious. They keep well too. I based them loosely on the pistachio biscuits with rose and almonds I made for Christmas gifts one year. These were less sweet, but crumbly and nutty with a subtle vanilla flavour and were enjoyed by all. Crumbly vegan cookies made with ground almonds and wholemeal spelt flour and flavoured with vanilla. Not too sweet, but perfect with a cup of tea. Grind the almonds in a blender or coffee grinder. Cream the coconut oil and sugar together until light and fluffy. Beat in the salt and vanilla extract. Add the flour and ground almonds and stir with a wooden spoon until the mixture has a sandy type texture. Add the milk and stir with a flat bladed knife. Bring the mixture together with your hands to form a dough. Roll walnut sized pieces into balls with the palms of your hands. Place slightly apart on a lined baking tray and bake at 170℃ for about 15 minutes or until just golden. Allow to cool for 10 minutes, then roll in the icing sugar. Place on a wire rack to cool completely. If the dough is too soft, place in the fridge for 30 minutes to firm up. Adapted from Pistachio Biscuits with Rose & Almonds. Please note: calories are per serving. They're approximate and will depend on exact ingredients used. I’m sending these vanilla almond cookies off to Treat Petite with Cakeyboi and The Baking Explorer. They also go to Corina at Searching for Spice for Cook Once Eat Twice. I did manage to make them last more than one day – honest! And finally I’m sending a few of these tasty little biscuits to #CookBlogShare with Mandy at Sneaky Veg. Thanks for visiting Tin and Thyme. If you make these delicious little vanilla almond cookies, I’d love to hear about it in the comments below or via social media. Do share photos on social media too and use the hashtag #tinandthyme, so I can spot them. For more delicious and nutritious recipes, follow me on Twitter, Facebook, Instagram or Pinterest. Post commissioned by Dream®. I was not expected to write a positive review and all opinions are, as always, my own. Thanks to my readers for supporting the brands and organisations that help to keep Tin and Thyme blythe and blogging. Nice and delicious vegan cookies and very easy to make so it seems. With these ingredients you do not need a lot of sugar. I have tried several grain milks before, but always went back to ‘normal’ milk (most often goat’s milk nowadays). What keeps me from using alternative milks more often is the sunflower oil. It has an adverse effect on my stomach and I do not like the taste either. Pity, because I like the idea. Have you tried sheep’s milk Henk? It has a nicer flavour than goat’s I find and is meant to be more attuned to the human body – or so I’m told. There are farms with milking sheep in the area , but they are not allowed to sell raw milk. Till now I haven’t seen sheep’s milk in any supermarket or even organic shop. Only yogurt and cheese. I’d definitely buy and try it. Goat’s milk can indeed become rather strong flavoured after a couple of days. I use it up in breads and pancakes then. Oh those sound delicious Choclette, just right with a nice cup of tea!! I’ve been experimenting with more vegan baking too recently, and I’m always pleasantly surprised as to how easy it is to substitute in dairy-free milks etc. with great results. I haven’t tried baking with rice milk before but must give it a try, these sound lovely! Thanks Kate 🙂 Rice milk is a good one to use if you’re averse to nuts or soya and it works perfectly well in baking. To be honest anything with almonds gets my vote and these look like traditional Greek cookies called ‘amygdalota’ which I am totally addicted too. I need to try this milk – mostly use almond milk but don’t like it in coffee. I’ve heard they’re also similar to Mexican wedding cookies and Russian tea cakes, so it just shows that almond cookies are the best 😉 I’m off to check amygdalota now. They look very delicious! Can’t resist anything with almonds. Almonds are just brilliant and I find grinding them yourself makes for a much better flavour and texture in bakes. Thanks Camilla. The dough was perfect for rolling, so they were also really easy to make. They look adorable! I don’t think I’ve ever baked ball shaped cookies! I love that you made them healthy and vegan for veganuary 🙂 The rice milk sounds yummy, need to give it a try. Oh I haven’t ever tried rice milk before, is it a nice texture? These biscuits look like the perfect treat for Veganuary! Thank Sus. I like it and yes the texture is good, though it is more equivalent to skimmed milk than full milk I reckon. 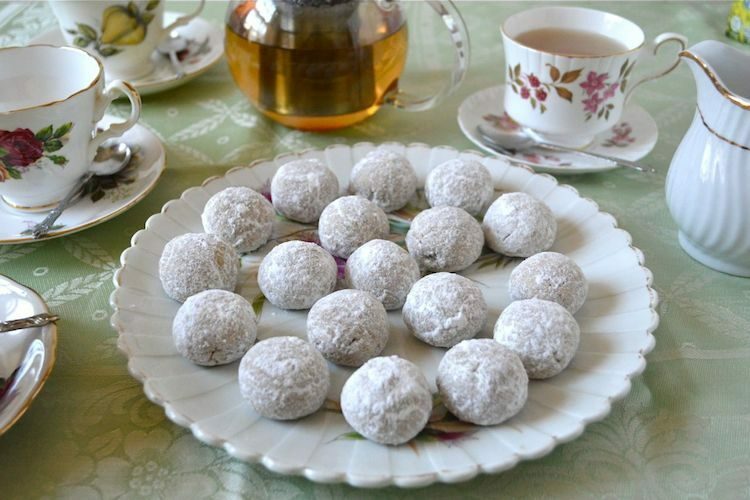 These cookies looks delicious and enjoying with a cup of tea sounds wonderful. I have tried almond milk but never the rice, will have to change that. Definitely worth trying, even if it’s only to confirm you prefer almond milk! Thanks Corina. I think it must be the almonds, but one cookie was surprisingly satisfying – not that that stopped me! These look adorable, and I like tgat they ate healthy too. I have tried rice milk and its a tually quite nice. I have yet to bake with it. Thanks Nayna. They were delicious and rice milk works fine in baking. I love little biscuits you can just pop into your mouth! I would have mine with coffee though as I don’t drink tea!! These are simply wonderful, Choclette – I love them (although I didn’t have spelt, so I used teff, and they worked really well). They look so charming too, don’t they? Really elegant little cookies! Thank you so much for allowing me to share this recipe on my Perfect Vegan Valentine round-up. The post is now live if you want to check it out (an’ y’know, share it around a bit)! Thanks Nico, I have and I did. Glad you liked the cookies. I’m now intrigued to know how they tasted with teff. Glad they worked for you. Photos?